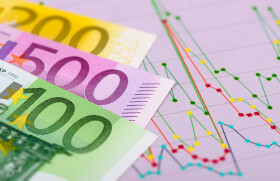 The euro today traded in a see-saw pattern against the US dollar marked by extreme rallies and declines to culminate in a sustained drop during the American session. The EUR/USD currency pair today fell as the US dollar rallied and investor sentiment shifted in favor of safe haven assets such as the greenback even as US equity markets edged higher. The EUR/USD today fell from a high of 1.1313 to a low of 1.1279 and repeated the process twice before settling to trade near the lows at the time of writing. The currency pair opened today’s session with a neutral bias before quickly dropping lower then recovering for the rest of the Asian session. The pair’s gains were driven by positive investor sentiment as Asian stocks rallied higher. The pair fell to its daily lows following dovish comments from European Central Bank members regarding the eurozone’s economic recovery. The release of the German ZEW survey of expectations could not stop the pair’s drop despite the survey expectations coming in at 3.1 versus the expected 0.8. The economic sentiment print also came in above estimates, while the current situation print missed consensus estimates. The pair later recovered as US stock futures pointed to a higher opening level for the S&P 500, the DJIA, and the Nasdaq. The pair later declined as the US Dollar Index rallied to a high of 97.09. The currency pair’s future performance is likely to be affected by tomorrow’s eurozone inflation data. The EUR/USD currency pair was trading at 1.1287 as at 19:21 GMT having fallen from a high of 1.1313. The EUR/JPY currency pair was trading at 126.41 having dropped from a high of 126.68.